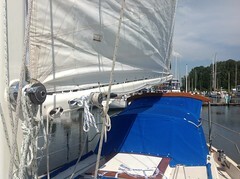 Fortunately our boat was in very good condition when we purchased her in 2009. 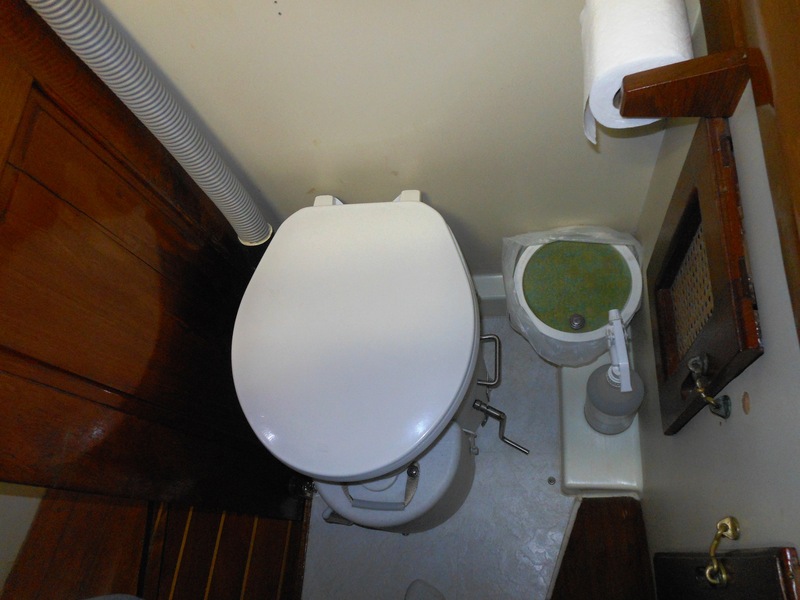 The previous owner had been a live aboard for about 10 years and tried to take good care of her. He had a Webasto forced air diesel furnace installed. He personally didn’t use it much as he was in Mexico his first few years. 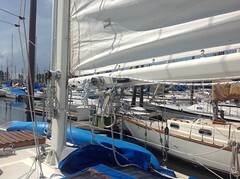 The last five years he spent in the marina with free electricity. He used electric heat and a two burner hotplate for cooking. Most of the interior was okay but very smelly and greasy. A couple weeks of hard work on the interior and a few new purchases made Konami our exciting new home. Galley when we purchased Konami. Alcohol stove and oven. A 9 gallon alcohol tank with filling hose was stored under the V-berth with the holding tank too. Scary! Double sink that was very narrow and difficult to work in, wouldn’t hold a gallon pan. Picture doesn’t clearly show the dirty, chipped and stained counter top. 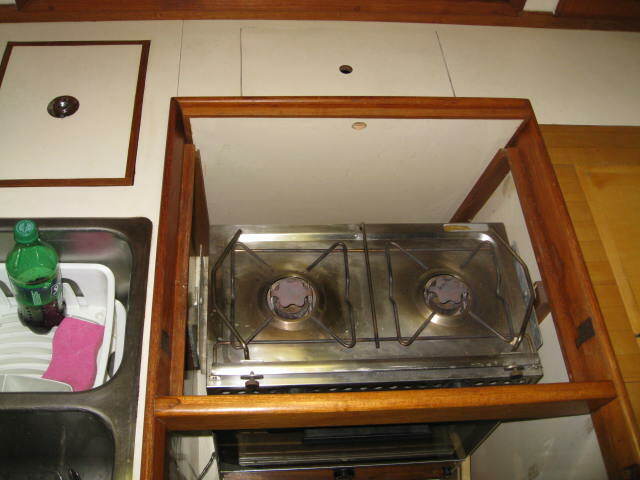 New Force 10 propane stove with 20 pound tank stored in a locker built in cockpit that Diane stands on to steer the boat. 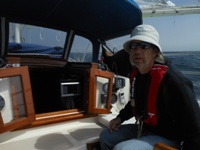 Propane can vent into the cockpit (above waterline) draining overboard. The new sink holds lots of pans, large enough to work in comfortably and is 8″ deep. The new counter top is bright and clean. 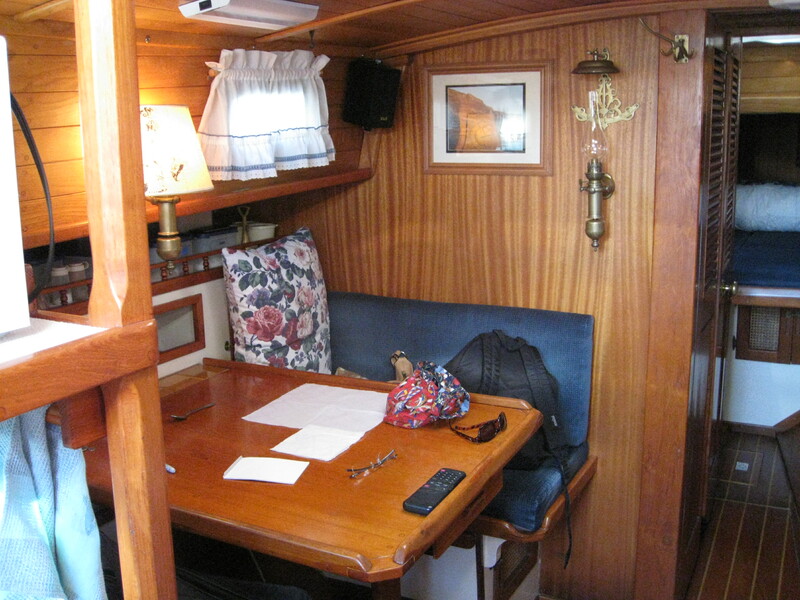 BEFORE: Porthole frames and glass were original. The glass was milky, frames were covered with varnish so wouldn’t polish out. We removed all the port lights, put in new glass, seals and polished to a high sheen. All the new parts were ordered locally. Hardest part was drilling out broken screws that held the glass ring in place. 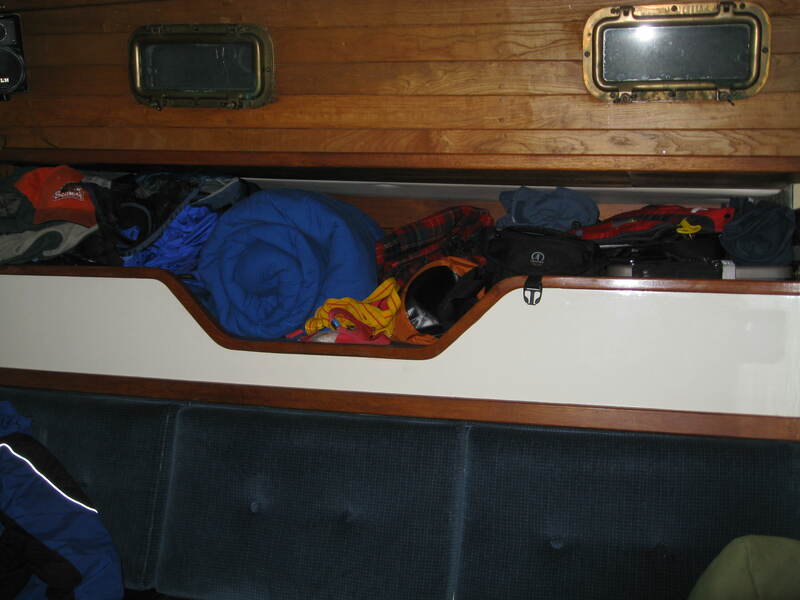 The interior of the boat the day we bought Konami. 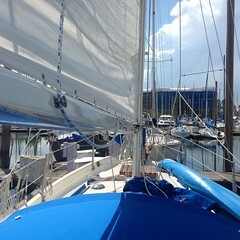 The salon and V-berth fabric was still in good condition. 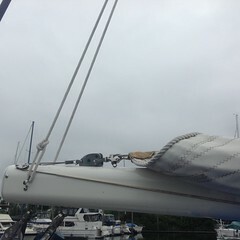 We pulled off the covers and had them dry cleaned twice, and put in all new foam to get rid the of head smell. Fortunately the wood paneling and wood around the windows showed no staining from leaky windows or cap rails. The teak and holly flooring is in decent condition. 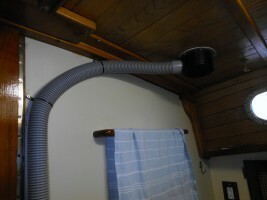 AIRHEAD: Removed the electric toilet and holding tank from under the V-berth. The holding tank been leading around the intake fitting. 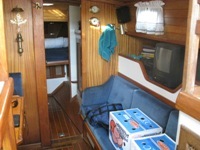 First order of refurbish when we moved aboard. The side vent option hadn’t come out yet so we made our own. 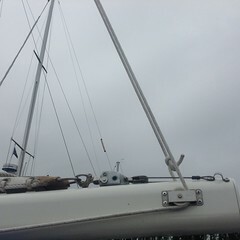 There is a nicro solar vent on the cabin top where the vent is attached. 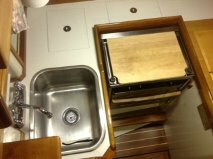 Painted and varnished the V-berth, head, inside all the cabinets and removed the smelly teak flooring around the old head.